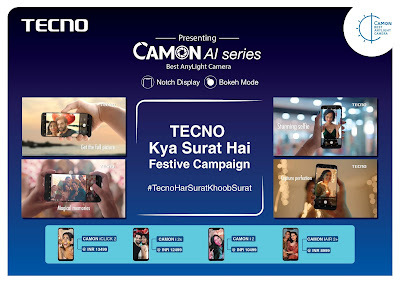 Following an efficacious launch of new CAMON AI series consisting of 4 smartphones early this month, TECNO Mobile, a premium smartphone brand from TRANSSION India, today unveils its striking TV ad campaign for festive season. The TVC is part of the overall 360-degree campaign for 4-weeks starting 10th Oct until 11th Nov’18. The ‘HarSuratKhoobsurat’ campaign for TECNO new range of camera-centric smartphones is based on the philosophy that India is blessed with beauty all around and it’s not just scenic, this beauty lies amongst us all. It can be seen on every face we come across. And it deserves to be captured, even more beautifully. It also truly compliments what the new TECNO CAMON AI series has to offer through its superb Best Anylight AI camera smartphones that aims at clicking exceptional pictures in any light condition. The brand has taken an aggressive approach of rolling out #TECNOHarSuratKhoobsurat festive campaign across multiple mediums ranging from TV, digital, social, radio, on-ground & retail. The 4-week TV campaign will be available across national and regional channels. The campaign will be further amplified on Social and digital platforms. To help consumers get a first-hand experience of the “Best Any Light” camera smartphones the brand will carry more than 3000+ on-ground activities covering 1200 cities enabling direct engagement with our Consumers & Retail partners. Early this month, the brand announced the new range of TECNO CAMON AI series consist of 4 smartphones – CAMON iAir2+ priced @8999, CAMON i2 @10499, CAMON i2X @12499 & CAMON iCLICK2 @ 13499. The range flaunts many features which will change the game in the sub 14K segment such as 6.2” HD+ screen, 19:9 Super Full View notch display, 24MP AI selfie, 13+5MP Dual rear AI camera, Dual SIM, Dual VoLTE (4G+4G), 3750mAh and AI Face Unlock.